Cummins said he knew he wanted to go to Texas, so when he got the offer, he took it on the spot. He actually lived in Lake Travis and went to St. Andrews High School before moving to Fort Worth. The defensive end helped Fort Worth All Saints Episcopal to its second state championship this year. In a recruiting world filled with gray, Max Cummins’ commitment came as a surprising case of black and white. It even caught Texas assistant coach Oscar Giles off guard. Giles was there to show the 6-6, 255-pound defensive end from Fort Worth All Saints Episcopal, that he was a priority. Texas wanted a big defensive end with the ability to play with his hand on the ground and as an attacker off the edge. Cummins is that player. He’s athletic for his build and has the potential to grow into a defensive tackle. So Giles offered. And Cummins committed on the spot. Once Giles’ shock wore off, Cummins called his future head coach. 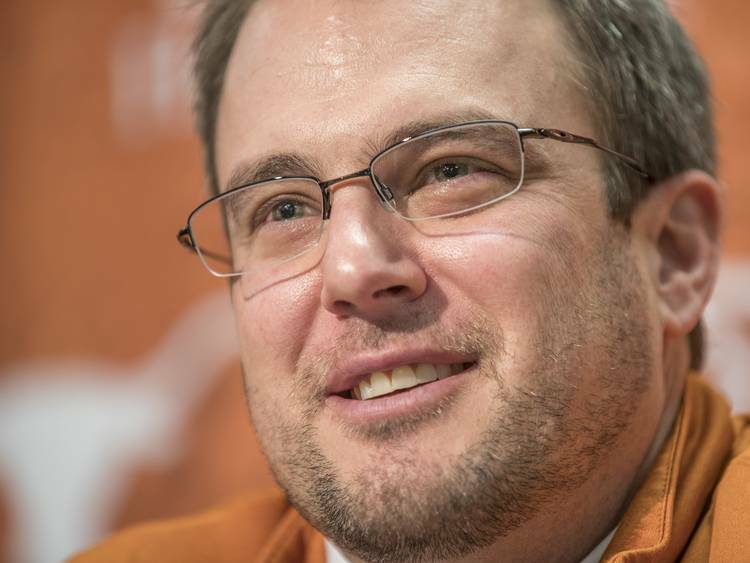 He described Tom Herman as “ecstatic” during the phone conversation. Giles then hung out at the house with Cummins, showing him a video and continuing to build an existing relationship. Austin was once home for Cummins. He left St. Andrew’s just over a year ago to finish his prep career at Fort Worth All Saints, where he helped lead the program to its second straight state title. His familiarity with the area from his time living in Lake Travis, combined with UT’s academic standard made it an easy decision; Cummins wants to major in business finance or business marketing, and knew that UT’s business school is ranked sixth in the nation. Cummins will visit Texas this weekend, along with fellow commits and a few important targets. Cummins and Temple’s Taquon Graham are Texas’ defensive end commits in the 2017 class. The Longhorns host Galena Park North Shore defensive end K’Lavon Chaisson this weekend as well. Next story: How did the Big 12’s early draft entrees fare against Texas? How did the Big 12’s early draft entrees fare against Texas?